Collectorate District Under Mid Day Meal Scheme, Arvalli published latest recruitment / bharti notification for post of District Project Coordinator & MDM Supervisor post on contract bases at Kutch Mid Day Meal Scheme. More Details about MDM Arvalli Recruitment 2018 are mention below read notification. 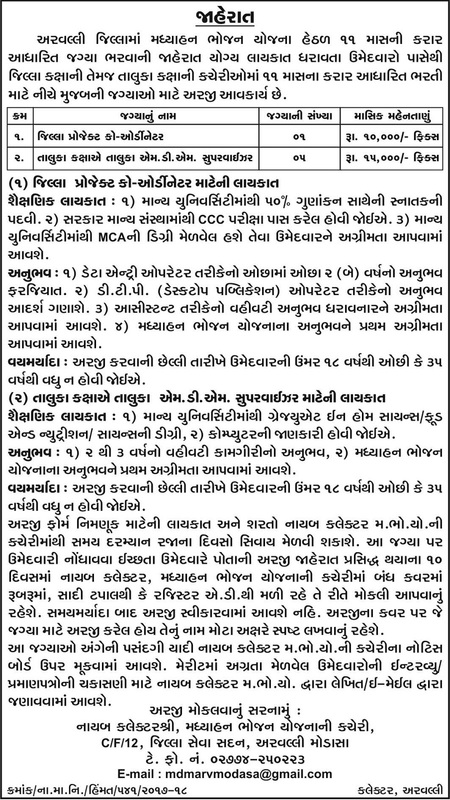 MDM Kutch Jobs Candidates Final selection will be based on Interview. Interested and eligible candidates can send their application in prescribed format along with all necessary documents & Certificates at mention below address before last date.